Mexicans have plenty not to like about Donald Trump: his racism, his wall, his tirades against immigrants. But if there's a disruption provoked by Trump we should actually embrace, it's the renegotiation of NAFTA--or even the trade pact's possible end. Along with Mexico's upcoming presidential elections on July 1--in which center-left candidate Andres Manuel Lopez-Obrador (AMLO, as he is popularly known) is the clear front runner--the possible unraveling of NAFTA has the country's business elite and political establishment freaking out. During its 24 years, NAFTA has helped to widen inequalities in Mexico, Canada and the United States alike--and to play workers in the three countries against each other. Since the pact went into effect, inequality in Mexico has risen to levels at triple the OECD average, while about half of the population remains in poverty. An end to NAFTA could help Mexico finally reduce its economic and political subordination to the United States, diversify its trade relations and develop a sovereign economic policy that benefits its population--not only transnational corporations. The most contentious issue in the NAFTA talks is the prevalence of very low salaries and labor standards in Mexico, which companies from the United States and Canada have exploited ruthlessly by moving jobs south of the border. This pressure has led the U.S. team to call for better labor standards in Mexico--a major progressive demand the administration would likely never take up for U.S. workers at home. In the latest rounds of negotiations, the U.S. and Canadian governments have proposed raising the minimum wage in Mexico. A recent letter signed by 183 members of Congress urges the U.S. Trade Representative to negotiate "a new NAFTA" with "strong, clear and binding provisions that address Mexico's labor conditions." And Peter Navarro, a trade adviser to Trump, said recently that "higher wages in Mexico are in the interests of Mexico and the United States. Without this adjustment, Mexico will never have a robust middle class, and our middle class will wither if not die." However, the Mexican government contends ludicrously that “salary policy is an internal matter." NAFTA was sold to Mexicans as a deal that would reduce the salary gap between Mexico and its neighbors to the north. In fact, this gap has only widened. Manufacturing workers in Mexico earn an average wage of about $13 a day, while the typical assembly-line worker in the United States makes $25 per hour, according to the Labor Department. As the Chicago Tribune reports, "In Mexico, $2 per hour workers make $40,000 SUVs." One could argue that many other jobs in Mexico depend on foreign investors--for example, the retail sector. However, as they have in the United States, foreign companies like Wal-Mart have displaced scores of smaller Mexican companies, destroying countless jobs. According to small and medium business leaders in the country, more than 600,000 companies have gone bankrupt during the current administration alone, and only 5 percent of Mexico´s companies export. Despite containing a nonbinding environmental side agreement, NAFTA's "environmental safeguards" never had the funding or legal mandate needed to actually protect the environment. And so NAFTA has had a terrible effect on the health of North American communities, as several co-authors and I documented in a 2014 report published by the Sierra Club. Since then, the Mexican government has granted more than 32,000 mining concessions and devoted more than 20 percent of Mexico's land to mining, which has been devastating for the environment. Mexico has meanwhile become the world's leading importer of toxic sodium cyanide for mining, which is a major source of water contamination. While the rights of foreign mining companies are strongly protected under NAFTA, the pact's environmental side agreement has not required Mexico to better regulate the harmful environmental impacts of runaway extraction. Commercial rights are better protected than environmental and human rights. NAFTA backers' promise that Mexico would become an "agro-exporting power" failed. Instead, Mexico now imports 45 percent of the food it consumes, making it one of the most import-dependent countries in the world for food. Mexico now relies heavily on the United States for basic staples like corn, soy, wheat, rice, and beans. According to one study, in fact, a stunning 99 percent of Mexico's imports of corn come from the heavily subsidized U.S agriculture industry. All this has cost Mexico more than $20 billion in the last five years alone. Food dependency reflects the devastation of Mexico's small farmers' livelihoods since NAFTA. Left to compete with U.S.-based mega-exporters, millions of Mexican farmers have been driven out of work, driving displacement, impoverishment and massive social disruption--and creating huge opportunities for organized crime groups. Although foreign direct investment from NAFTA has been heralded as the panacea for economic growth, Mexico's economy grew at "an anemic 1.2 percent growth rate per capita from 1994 to 2016," according to The Washington Post. And even that modest growth has been heavily concentrated in few economic enclaves, accentuating regional disparities. NAFTA's “investment chapter” helped establish a so-called Investor-State Dispute Settlement (ISDS) mechanism that lets corporations sue governments in supranational tribunals, like the World Bank's International Center for the Settlement of Investment Disputes, when a government's regulation in the public interest tampers with corporate profits. In talks over another agreement -- the Transpacific Partnership -- Mexican Secretary of Economy Ildefonso Guajardo gave a reason: "The trade agreement will give protection” in the event that “future presidents of the country try to revert Mexico´s energy reform." In other words, ISDS is a tool for the present government to cement the privatization of Mexico's oil and other industries. No wonder Jack Gerard, head of the American Petroleum Institute, says that ISDS is crucial to maximizing the industry's economic upside in a new NAFTA deal. Because the initial promises for NAFTA utterly failed, the new spin is to hype its "consumer benefits." Extreme examples in The Washington Post, for instance, celebrate that Mexico is "buying more U.S. goods than ever" and that in "Mexico's Costco stores, staples such as tortilla chips and chipotle salsa are trucked in from factories in California and Texas that produce for both sides of the border." 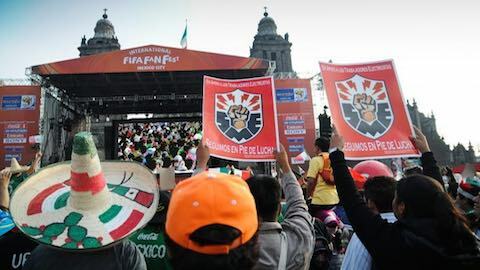 The reality is that the Americanization of Mexican culture has meant the destruction of Mexico's food security and sovereignty--and with it, Mexicans' health. The consumption patterns encouraged by a glut of U.S.-made processed foods have made Mexico the second-most obese of the OECD, with diabetes becoming the country's leading cause of death. The Institute for Agriculture and Trade Policy has documented that Mexican diets under NAFTA have shifted “from traditional food staples toward energy-dense, processed foods and animal-source foods--which tend to be higher in fats and added sweeteners." The New York Times similarly reported late last year that NAFTA had transformed Mexico "in a way that would saddle millions with diet-related illnesses." Mexico needs trade agreements that include binding labor chapters, support small and medium companies and don't rely on suppressing wages. Complex, anti-democratic investor privileges should be excluded. Manuel Perez Rocha is an associate fellow on the Global Economy Project at the Institute for Policy Studies. Photo: Workers protest in Mexico City (WikiMedia Commons). Latin America: "Why Mexican Workers Would Cheer the Demise of NAFTA"